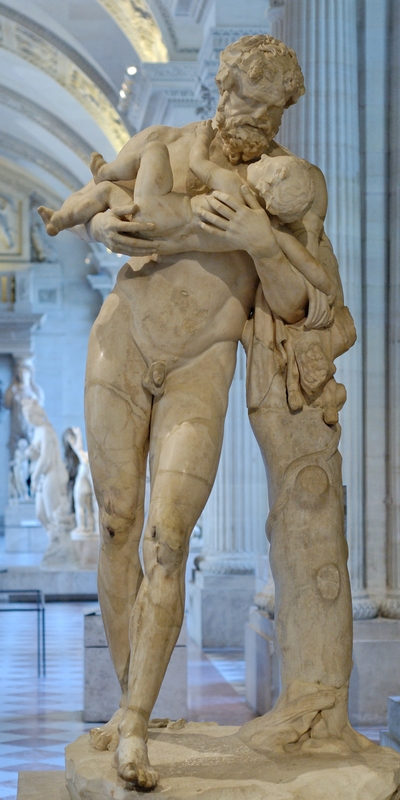 Silenus, tutor to Dionysus, God of Wine, holding the baby Dionysus. Louvre. Two prevailing characteristics of the Languedoc-Roussillon are that the region is steeped in history, specifically wine history, and it is known for its ripe, red wines. But this once again up-and-coming wine region is taking its future in its own hands by using innovative approaches to freshen up its image. One of those approaches is to celebrate its vineyards’ white and rose’ wines. In June and then again in November, the wineries of the region are encouraged to throw open their doors to tasters and wine buyers to especially highlight their rose’ and white vintages. Back in the region’s heyday, during the XVII c., wines of the Midi, particularly its Muscats, and especially its Muscats secs, rivalled the wines of Burgundy. Wines from St. Georges d’Orques, a village where wineries still operate today, were known from border to border throughout France. Cave de Roque Brun, St. Chinian. They are in the Guide Hachette and have won a Gold Medal in Paris’s Concourse Generale Agricole. Domaines de Gallieres, a new vineyard that presented its “Salsa de la Vigne” at this year’s tasting festival, a light-hearted rose’ that pairs well with melon, prosciutto, feta wrapped in marinated red peppers. Domaine Pibarot in Mus who handpicks their grapes and uses no pesticides. Domaine du Silene. Legend has it that an effigy of Silenus, the tutor to Dionysius the Greek God of wine and the grape, was found on the premises and watches over the estate. Vineyards thrive in the exceptional clay and limestone soils. Domaine de Montnegre whose Rose’ is under the AOC Coteaux du Languedoc and made by blending Syrah, Grenache, Cinsault. Fresh and aromatic, it pairs well with light repasts. Their white, a blend of old Carignan blanc and Ugni blanc, is vin de Pays. Le Domaine Puech, in Saint-Clement-de-Riviere, is a local favorite. Their Vin de Pays d’Oc Chardonnay with a floral, vanilla nose and a well-balanced, ample mouth. Les Chemins de Carabote has a Terrasses du Larzac which exhibits both strength and elegance, richness and complexity. Featured in Guide Hachette. Les Vignerons du Pic offers their “Gres de Montpellier,” which is their wine that’s on the map. The AOC Gres de Montpellier was obtained in 2003 and encompasses most of the villages that are situated in the “Agglomeration” Montpellier. With this classification, the vineyards of the region are re-exerting and re-establishing their importance in the national culture of wine. Domaine Jordy, which can be found in Le Bosc, keeps 500 hectares of vineyards under cultivation amidst 2500 hectares of garrigue, the native Mediterranean scrub brush thought to lend its aromatics of thyme, rosemary, lavendar to the wines. To keep with their whites and rose’s try the Cers Vent, Viognier and Rose’ cuvee’ speciale, as well as their Blanc vendanges passerillees for a dessert wine.